Baby acne usually develops on a newborn's skin and can occur anywhere on the face. But it usually appears on the nose, forehead and cheeks. Baby acne is quite common and is temporary. About 40% of infants develop baby acne which commonly begins at two to three weeks of age and usually disappears well before the baby is six months old. 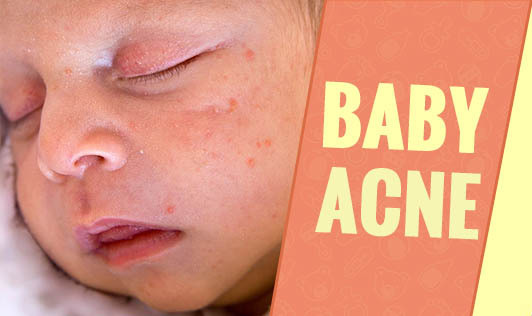 Luckily, baby acne does not bother your baby much and it does not leave any permanent scars like adult acne. The cause for baby acne is unclear; although, doctors say that hormones are a prime suspect. The mother's hormones that circulate in the baby's bloodstream stimulate sweat glands in the baby. Moreover, since the pores in a baby's skin are not yet fully developed, they can clog easily resulting in acne. • Keep your baby's face clean by washing it with warm water daily. There's little that you can do to prevent baby acne except to wash it, watch it and wait. The best treatment for baby acne is usually none at all and it goes away with no intervention. However, it's important to bring it to your paediatrician's attention if you're not sure whether the bumps that you see are baby acne or something else.